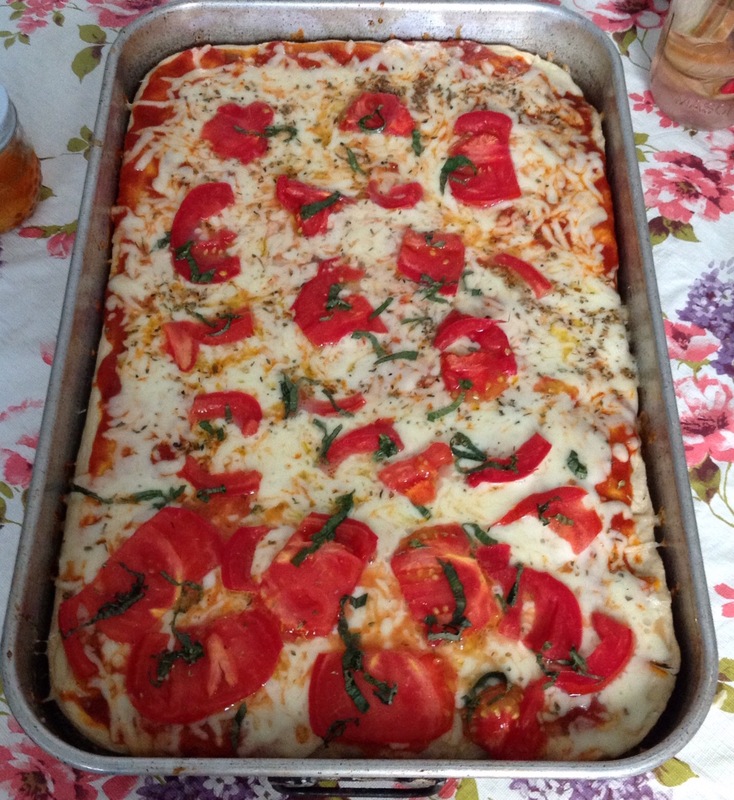 When I was growing up my father made delicious Sicilian pizza every Friday night. It was a thick rectangular focaccia topped with sauce and cheese. My mother remembers her aunts making a similar version topped with anchovies, particularly during the Lenten season. Sicilian pizza was one of my childhood comfort foods and continues to be. We keep the tradition of Friday night pizza in our home too. Sometimes we make thin crust pizza but once a month I need to have the Sicilian style pizza my father made. My dad used a 12x18x2 size pan and I still use his pan. You will need two batches of dough for this recipe. You can double the recipe below or make two individual batches of dough. I prefer making two batches. Begin mixing the dough in the mixer, keeping the dough somewhat sticky. Then pour it out onto the floured counter, add a bit of flour to the top of the dough, and knead it for just a minute. It will still be quite sticky. Let it sit for 5 minutes, then continue adding flour a little at a time and kneading until you get a smooth but still slightly tacky dough. Then let it rise. In a mixing bowl combine yeast, sugar, and water. Whisk to combine and let sit 5 minutes to foam. Add olive oil, salt, and 1 cup flour. Mix well. Add 1 cup flour. Mix well. Add 1/2 cup flour. Mix. Add 1/4-1/2 cup more flour. Mix. Pour out onto well-floured counter. Knead for 1 minute. Form into a ball and let sit for 5 minutes. Add a few more tablespoons flour and knead until you have a smooth dough. You may need more flour. You want it just a little tacky and not too floury. Place in an oiled ceramic bowl. Cover tightly with plastic wrap and let rise 2 hours. Preheat oven to 400 degrees. Oil a 12x18x2 baking pan. Pour risen dough into pan and spread dough to the edge of the pan. Bake for 20-25 minutes until the crust has a few golden spots on the top and the dough is cooked. Remove pan from oven. Spread tomato sauce over the pre-baked dough. Sprinkle with mozzarella, then Parmesan. Sprinkle herbs and salt and pepper over cheeses. Drizzle topping with a little extra virgin olive oil. Add fresh tomato slices if desired. Return to the oven for another 5-7 minutes until the cheese has melted and toppings are hot. Serves 6-8. This entry was posted in Appetizers, Breads, Christmas, Vegetarian. Bookmark the permalink. Oh, that looks so good!! I’m inspired for tomorrow! You are a bread expert. Enjoy.